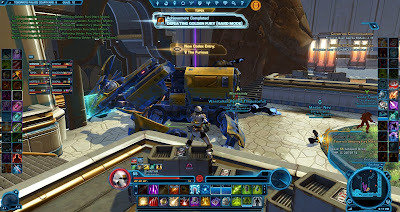 Last night my raid team finally downed Golden Fury in Toborro's Courtyard on 8-person hardmode. We were quite a bit behind the curve on that one, considering that we've been working on TfB and Scum nightmare modes for a while now. We have however had a pretty bad history with this boss. 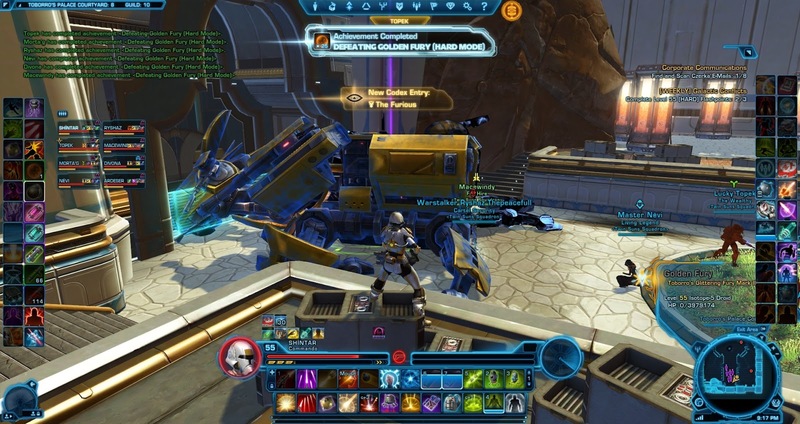 I don't recall us having any issues the first time we downed it on story mode, but when we first tried hardmode shortly after expansion launch, it still seemed a little out of reach considering our gear levels at the time. We decided that we were going to come back to it later, and we did... but every time we tried to make progress on the fight, it was as if we were cursed. Once we nearly had the boss down and then one of our dps disconnected and didn't come back online all evening. Another time the whole instance seemed to bug out after a patch, and when we switched it from hard to story mode, the boss's health and damage output actually went up instead of down. Considering that it's a very long fight that offers little in terms of reward, it just didn't seem worth the effort of coming back again and again to work on beating it. It was only after we finished a quick Scum hardmode farming run last night and found ourselves with quite a bit of time left that we decided to have another go at Toborro's Courtyard - with the added promise that if we got the boss down, we weren't going to go back ever again. I guess we won't have to now. To be honest I think Toborro's Courtyard has been a bit of a disappointment in general. I was open to the idea of putting the world boss for the weekly into an instance, but in practice it just doesn't feel right. I think of bosses like Nightmare Pilgrim and remember things like the fun I had spectating as other people fought him, or the suspense of meeting competition in the form of another ops group when we were out as a guild to hunt him ourselves. Yes, the boss being out in the open world meant that we didn't always get our kill, or that we had to wait for a respawn, but that just added to the experience. It was something different. A world boss in an instance is just a really small raid... and in the case of Toborro's Courtyard, one that's very out of the way and offers little in terms of meaningful rewards. That just leaves the fight itself as a source of entertainment, and unfortunately that falls pretty flat as well. Maybe it's different for people who play more crucial roles, like the add tank, but from my point of view as a healer it's a terribly boring fight, and I imagine it's not that much better for most roles. Whack the boss/heal, dodge the massive lasers, go back in, dodge back out, go back in, dodge back out, and so on and so forth for fifteen minutes or however long the fight is exactly. More than anything else, the challenge seems to lie in not losing your focus as you go through the same set of repetitive motions over and over again, and at least in my opinion that's not a very fun challenge. I can only hope that if/when Bioware decides to add another world boss in an upcoming patch, they won't use Golden Fury as their role model. I've had a similar experience. It's a repetitive fight that goes poorly enough early on to just ignore it. My team will do it eventually, but I can't get excited about it. The same experience here with my guild... did it a couple of time on HM and got close (needed a bit more DPS though), then summer came and my Rep guild became inactive - as a result I've still not done it, although my Imp guild did do it. I don't really mind either, just like you it doesn't feel as engaging for some reason. Funny how that sometimes works out.